Info State Representative John T. Yudichak was first elected to represent the residents of the 119th Legislative District on November 3, 1998. 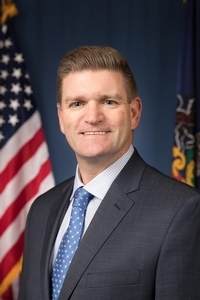 Rep. Yudichak has built a strong reputation for providing professional and responsive services to constituents at his district offices in Nanticoke and Fairview Township. In Harrisburg, Rep. Yudichak serves on the Education Committee, the Environmental Resources & Energy Committee, and the Finance Committee. He serves as the co-chairman of the bicameral Penn State Forum on Higher Education. Rep. Yudichak is noted for his leadership on major issues such as tax reform, health care, education, and the environment. He is also a leading advocate for regional municipal cooperation. Rep. Yudichak is active in numerous civic organizations, including The Luzerne Foundation, The Advisory Board of Penn State Wilkes-Barre, Newport Township Lions Club, Plymouth Township Recreation Association, and Sons of the American Legion, Larksville Post. Rep. Yudichak founded the Yudichak Family Lighthouse Fund, a local charity benefiting local libraries and youth programs, to honor his parents, Joseph & Sarah, and his six siblings. He is a graduate of Greater Nanticoke Area High School, Wyoming Seminary, and the Pennsylvania State University. He resides in Nanticoke City with his wife, attorney Heather Yudichak.